When it comes to addressing Climate Change, scientists have known for some time that changing our habits is no longer enough to meet the challenge. In addition to adopting cleaner fuels and alternative energy, carbon capture – removing carbon dioxide gas from the air – will have to become an active part of our future habits. In addition to geoengineering processes, such as introducing sulfur dioxide into the upper atmosphere, carbon capturing technologies will likely need to be built into our very habitats. And that’s where the Bloom comes in, an artificial coastline habitat that will also generate carbon-consuming phytoplankton. In a world characterized by rising ocean tides, shrinking coast lines, changing climates, and extreme weather, a water-based living space that can address the source of the problem seems like an ideal solution. In addition to being waterborne, the Bloom is hurricane proof, semi-submersible, and even consumes pollution. 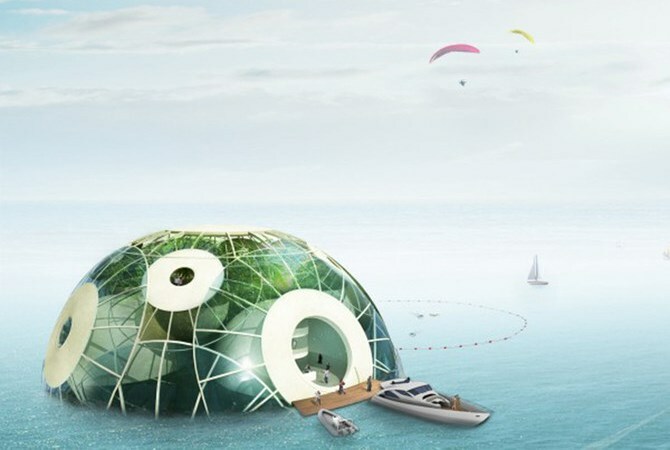 Designed by the French firm Sitbon, these structures are a proposal for a research station moored to the seabed with a system of cables and would both house researchers and grow carbon-dioxide absorbing phytoplankton. 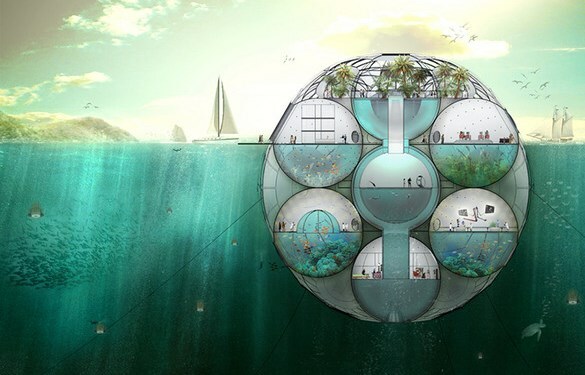 While it’s more of an experiment than a vision for what housing looks like in the future, their goal is to install them in the Indian Ocean as part of an attempt to monitor tsunamis and absorb carbon dioxide. Alongside skyscrapers that utilize vertical agriculture, carbon-capturing artificial trees, and buildings that have their own solar cells and windmills, this concept is part of a growing field of designs that seeks to incorporate clean technology with modern living. In addition, for those familiar with the concept of an Arcology, this concept also calls to mind such ideas as the Lillypad City. Bloom wishes to be a sustainable answer for rising waters by decreasing our carbon footprint while learning to live in accordance with our seas. Every factory would have its own bloom allowing it to absorb the CO2 that it created. And even if it doesn’t pan out, funding for the design and its related technologies will lead to innovation in the wider field of sustainable architecture and clean energy. And who knows? Might make some really awesome seaborne property! Powered by the Sun: Solar Powered Aircraft! Fun! 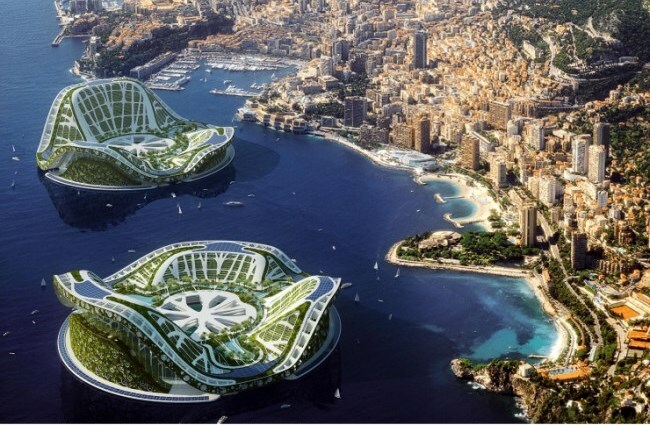 I could definitely picture myself living in one of those lilypad cities. Although I get the feeling these waterborne type cities work better in tropical climates. The most I can hope for up here in Canada is that it doesn’t start hailing again until at least September. This is awesome. Makes me wanna do a fast forward to 60 years so I can live like a sci-fi geek…or I’ll just have to settle writing as one. In the 4th. line, shouldn’t “will” be “with”? Alongside skyscrapers that utilize vertical agriculture, carbon-capturing artificial trees, and buildings that have their own solar cells and windmills, this concept is part of a growing field of designs that seeks to incorporate clean technology will modern living. In addition, for those familiar with the concept of an Arcology, this concept also calls to mind such ideas as the Lillypad City. Noted and corrected. Thank you.